If Mayor Michael Hancock and his Department of Public Works don’t set aside funding for Denver’s plan to build a comprehensive bike network, it might as well not exist. That’s the message Denver City Auditor Dennis Gallagher sent to DPW Manager Jose Cornejo in a scathing report released today [PDF]. 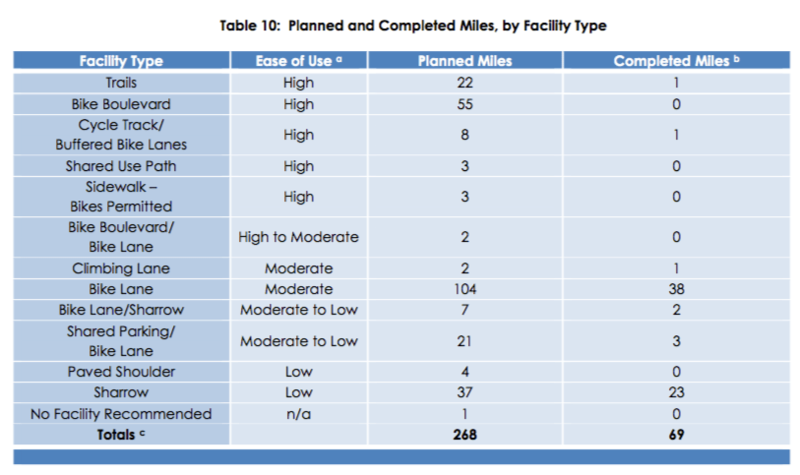 City leaders often boast about Denver Moves, the 2011 framework meant to place excellent bike facilities within a quarter mile of every household, but they haven’t delivered as promised. Just $2.8 million of the $119 million needed to implement the plan has been set aside by the city’s capital improvement fund, the primary source of support for Denver Moves. Denver Moves has not been implemented as envisioned. Public Works has employed a disjointed and financially inefficient approach, resulting in a fragmented system that includes less user-friendly bicycle and pedestrian infrastructure that does not further the goals of the Denver Moves Plan. The lack of concrete implementation milestones, coupled with inconsistent and inadequate funding, creates ambiguity about when, and if, the final network will be completed. Projected costs don’t reflect actual costs, which robs DPW of credibility when vying for funding from Colorado DOT and other agencies. One project was $76,000 over budget and another cost $39,000 less than originally thought. “Public Works officials acknowledged that the Department has not consistently tracked project-level budget data,” the audit states. DPW doesn’t have enough project managers to carry out the plan. Other capital projects often interfere with Denver Moves’ implementation. The city tends to change designs in the face of pushback from neighborhood organizations and City Council members. DPW doesn’t have a timeline for the network’s completion. DPW has $47 million to spend on transportation this year, according to the city’s budget. Denver Moves received $400,000 of that, or less than 1 percent. The funding to address these issues is purportedly hard to come by. But is that really the problem when it comes to building out such low-cost infrastructure, or does the problem boil down to what Hancock and DPW see as their top priorities for the money at their disposal? In Seattle, the priorities are different: The city recently pledged $35.5 million over six years to implement it bicycle master plan. “Why spend money on a small proportion of users” goes the common argument when prioritizing transportation dollars spent on cars versus active and public options…apparently without realizing the irony in this clear chicken-egg issue. Penny wise and pound foolish. Not surprising.